Ukraine's Verkhovna Rada has failed to pass the vote of no-confidence in the government of Ukrainian Prime Minister Mykola Azarov. Just 186 deputies voted for the draft resolution proposed by the opposition. 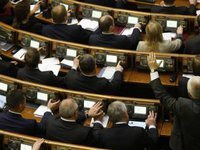 According to the Ukrainian Constitution, at least 226 votes are required in order for the Verkhovna Rada to pass a vote of no-confidence. As reported, the opposition earlier proposed adopting a parliamentary resolution that would be tantamount to a vote of no-confidence in the government, which was accused by the opposition of betraying the Ukrainian people. This draft resolution was registered in parliament by Batkivschyna faction leader Arseniy Yatseniuk, UDAR leader Vitaliy Klitschko and Svoboda faction leader Oleh Tiahnybok. On December 2, the state system and local governance committee recommended that the Verkhovna Rada hold a debate on this document. The document said that mistrust in the Cabinet of Ministers is expressed "through the government's betrayal of national interests, which was demonstrated by the violation of Article 8 of the Ukrainian law "On the basos of domestic and foreign policy" and in passing the decree No. 905 of the Ukrainian Cabinet of Ministers on November 21, 2013 "Issues of Signing the Association Agreement between Ukraine and the European Union on the one side, and the European Atomic Energy Community and their member-states on the other," the draft resolution said.